Complete your Dark Side Costume this Halloween with this Quality Star Wars Darth Vader Mask and Helmet. We have Star Wars Masks and Accessories for any Character you choose to be at Dallas Vintage Shop! Star Wars Day, May 4, celebrates George Lucas’ Movies, Star Wars. We have several different costume events linked below in DFW area to celebrate, too. It is the way of the Jedi to be prepared, so we suggest you plan early and start getting your costumes together, now. Star Wars Trivia-May the Fourth Be With You! DON’T MISS ‘May the 4Th be With You’ Dallas. Celebrate the May the 4th Be With You, At the Pocket Sandwich Theatre 5400 E Mockingbird Ln Ste 119, Dallas, Texas 75206! That’s on 05/04/2019. 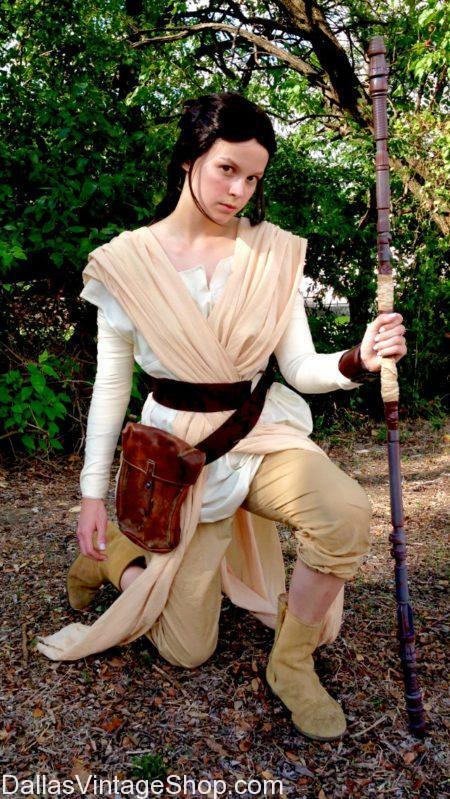 This Rey May the Fourth be With You Costume is only one Star Wars Outfit we keep in stock at Dallas Vintage Shop. Costumes are heavily encouraged at this May The 4th Be With You Event. Find awesome Star Wars costumes for men and women at Dallas Vintage Shop! From Rey to Hans Solo, we have all the Star Wars, ‘May the Fourth be With You’ 40th Anniversary Celebration Theme Party Costumes you need. Like this ‘May The Fourth Be With You!’ Star Wars Event Party, Sith Lord Costume? Then come to the Star Wars May The Fourth Event Party Carrollton, TX! That’s on Saturday, May 4, 2019 at 5 PM – 9 PM @ Downtown Carrollton Square. This Sith Lord, May the Fourth be With You, Costume is only one Star Wars Outfit we keep in stock at Dallas Vintage Shop. Panoptikon heavily encourages Star War Costumes at this May The 4th Be With You Event. Find awesome Star Wars costumes for men and women at Dallas Vintage Shop! From Sith Lord Star Wars characters to Hans Solo, we have all the Star Wars, ‘May the Fourth be With You’ Theme Party Costumes you need. May the Fourth be with You Party Tickets: FREE!!! “In a galaxy not so far away, the City of Carrollton will celebrate Star Wars Day with a free themed event Friday, May 4 from 5-9 p.m. on the Downtown Carrollton Square (1106 S. Broadway Street). Bring your lightsabers and come in costume to enjoy extra large galaxy-themed video arcade games, crafts, face painting, balloon twisting, laser tag, and photo opportunities. Stick around at sunset for a free showing of a galactic box-office hit under the stars. “May the 4th Be With You” has something for everyone from the young padawans to the Jedi masters. Feel the Force and test your skills in an extreme 35-foot interactive laser tag arena. Come early to pick up snacks or dinner from one of the many eclectic Downtown shops or restaurants, work up an appetite, and save the galaxy yet again from the evil empire. A variety of food trucks will be on hand to satisfy appetites with crowd-pleasing treats including cotton candy, snow cones, ice cream, nachos, and funnel cakes. Stop at the Carrollton Public Library’s booth and strike the perfect pose in front of a Star Wars-themed background for a unique photo op. Take home information on the Library’s Summer Reading Program running from June 1 through August 1 and be sure to save the date Saturday, June 1 for the Library’s Summer Reading Kickoff: C-Con event at Josey Ranch Lake Library (1700 Keller Springs Road) from 1-8 p.m.
Party in your favorite Star Wars Character Costume at the May The 4th Be With You: Star Wars Bar Crawl – Fort Worth. Saturday, May 4, 2019 at 2 PM – 10 PM @ Registration only at LANDMARK 3008 BLEDSOE Fort Worth TX 76108. 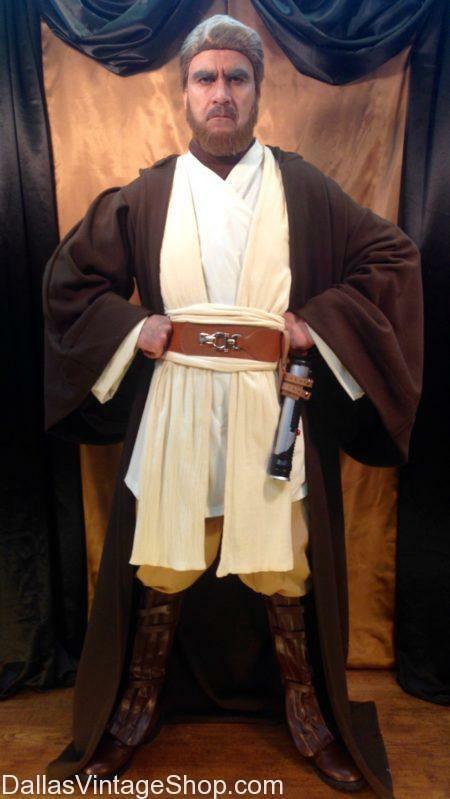 This Supreme Quality Obi-Wan Outfit is the May the Fourth be With You’ perfect Getup. 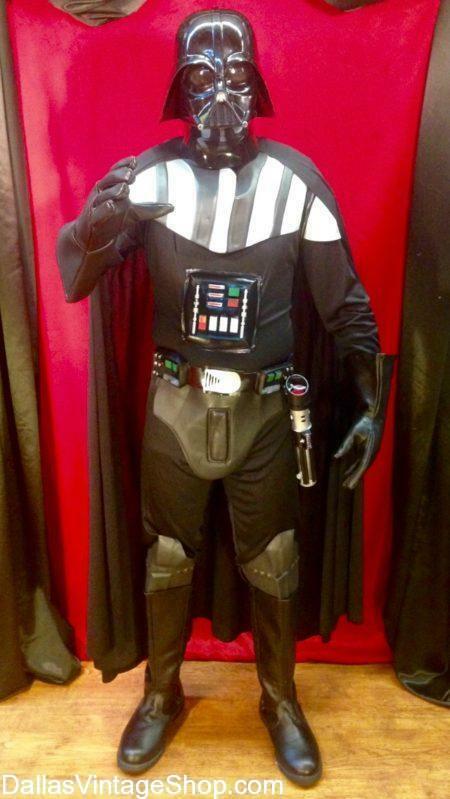 This Costume is only one Star Wars Outfit we keep in stock at Dallas Vintage Shop. Panoptikon heavily encourages Star War Costume participation at this May The 4th Be With You Event. Find awesome Star Wars costumes for men and women at Dallas Vintage Shop! From Obi-Wan Kenobi to other Star Wars characters like Hans Solo and Rey, we have all the Star Wars, ‘May the Fourth be With You’ 40th Anniversary Celebration Theme Party Costumes you need. STAR WARS FANS FROM ALL OVER TEXAS WILL BE HERE! Dress Code: We encourage all participants to come in costumes. There will be costume contests at certain bars! Props are welcome as long as they are not representative of weapons. If you can not make it by 5:30PM, then we recommend having a friend pick up your wristband ahead of time. They will need your electronic or printed ticket to check-in for you. Drink specials, specialty drink and food menus TBA! Where and when do I get my wristband and LIGHT SABER? Wristband and mug pick up will take place at LANDMARK between 2PM and 5:30PM. Sorry, you must be 21+ to join in on Bar Crawl fun. Please bring proper identification. Will food be available at the participating bars? How can I get to the bar crawl? 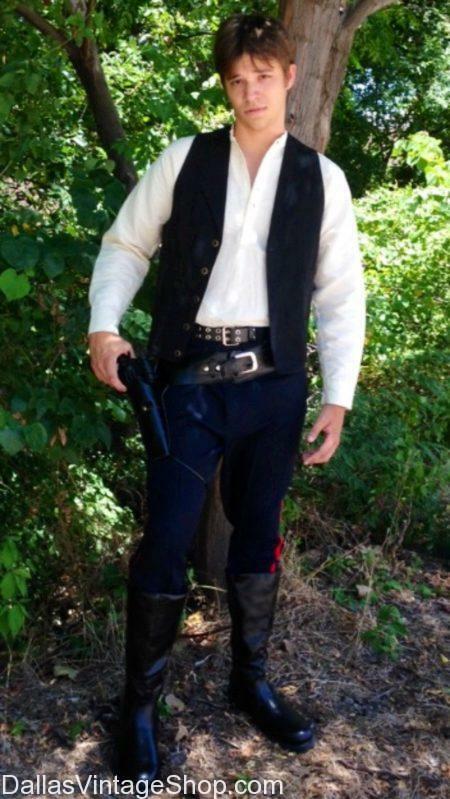 Like this Hans Solo, Costume? Then don’t miss the May the 4th Be With You! May the Fourth Star War Wars Costumes are heavily encouraged, find awesome Star Wars costumes for men and women at Dallas Vintage Shop! From Hans Solo to Darth Vader, we have all the Star Wars, ‘May the Fourth be With You’ Theme Party Costumes you need. Celebrate the May the 4th Be With You. Costumes are heavily encouraged, find awesome Star Wars costumes for men and women at Dallas Vintage Shop! From Princess Leia to Darth Vader, we have all the Star Wars, ‘May the Fourth be With You’ Theme Party Costumes you need. You are in 2019 05/04 May the 4th be with You: Star Wars Parties category.